Oleksandr Usyk could struggle against the giants of the heavyweight division when he steps up in weight, warns former two-weight undisputed champion, Evander Holyfield. Usyk retained all four of his cruiserweight world titles with an eighth-round stoppage of former WBC champion Tony Bellew in his last fight in November. The undefeated Ukrainian is now being pencilled in for his debut in the glamour division against Carlos Takam in Chicago in May. Against Takam, the 6-foot-3 Usyk will be the taller man, however, the southpaw will be at a disadvantage against the division’s undefeated big boys 6-foot-9 Tyson Fury, 6-foot-7 Deontay Wilder, or 6-foot-6 Anthony Joshua. Holyfield, who won the heavyweight crown four times after clearing up at cruiserweight, believes the 32-year-old will have to rely on his speed to make the transition a success. 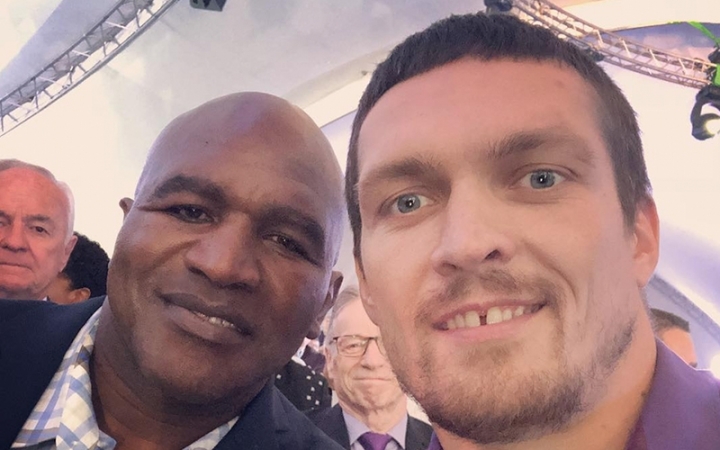 “Usyk is a real good fighter, he’s got real skills and he’s a left-hander,” Holyfield told The Ring. “He’s moving up, but heavyweights are bigger today, so I think it could be difficult for him. “Usyk is gonna be fighting guys who are 6-foot-9. In my day, the heavyweights were big, but they couldn’t bounce around like I could. I had good wheels; I could roll in and roll out. I could do all this, and Usyk will need to do them too. “It also depends on who he fights,” added Holyfield. “We had some great boxers at heavyweight, but in today’s era the amateur program – at least in America – is not as good as it was. That’s showing up when it comes to the boxing ability of the big guys. “Usyk might move very fast at heavyweight. The reason I was inspired to do it was because [Mike] Tyson was the heavyweight champion of the world. When we were amateurs, he was heavier than me and I was able to do well with him [in sparring]. He hit harder, but my arms were longer than his. He could hit hard with one shot, but I can hit you all day and all night. “Now, I heard that Usyk did well with [Wladimir] Klitschko in sparring. If that’s the case, then he knows he can do well with heavyweights. Hopefully Evanders good friend 'Evan Fields' can order Usyk some steroids and HGH to help with the transition. [QUOTE=Commie;19610455]Real Deal had only one thought about PEDs - „never to much“ But Usyk has a nice hgh tooth gap himself[/QUOTE] Any pictures of Usyk at 16 without this gap in his teeth?